This past weekend, I was on a cooking and baking streak, so expect to see some recipes from me this week. My favorite concoction, by far, was roasted butternut squash. The original recipe came from The Post Punk Kitchen. In its original form, it was meant to be a topping for pasta, but I didn't feel like eating pasta and thought this little dish could make a flavorful vegan side dish. 2. Cut the squash into half-inch cubes, and mince the garlic into small pieces. 3. 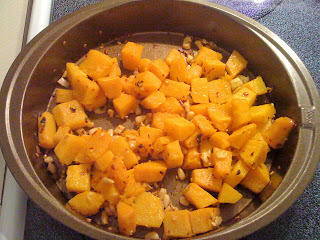 Put the squash and garlic with the pine nuts, pepper, and sage into an oiled roasting pan and pour the olive oil over everything. 4. Stir ingredients, making sure squash is lightly coated with oil, garlic, pepper, etc. This is a ridiculously simple recipe that packs a lot of flavor. In fact, maybe a little too much flavor. As I've noticed recently, fresh squashes absorb flavor like nothing else, so a little less pepper and garlic would probably be a good idea. At least a little less pepper if you're not into spiciness, like me. (I blame my Irish roots. I ate this squash and a Mexican snicker-doodle in the same day. My mouth still hasn't recovered.) I hate feeling like a fire-breathing dragon after eating a meal. But if you're into that sort of thing, bring on the spice! This sounds really good. If you are a person like me who likes to save fat calories for dessert the recipe can be tweeked a little. Since squash is moist when cut, you don't really need that much oil to make this. I usually just spray on just a touch of oil from the can or spritzer, mix it up with my hands and then add the spices. Thanks for reminding me that winter squash is in season and that I should pick some up at the westside market tomorrow. That's a great suggestion. I'll need to invest in some cooking spray. I hate it when my foods are too oily...and I don't like slathering my healthy veggies in fat!